Some say we now live in The Age of Global Communications. The owners and decision-makers of our shrinking earth communicate with one another, world-wide, through computers, fax machines, and electronic mail (e-mail). They say that those who do not master the New Communication Technology will be left behind. In fact, much of humanity has already been left behind. Today there are more hungry children in the world than ever before - not because of a lack of food and resources, but because of the growing inequality of distribution of resources. The model of global development based on greed rather than need has led to a brutal concentration of wealth. Today the world's 477 richest people (billionaires) have a total wealth greater than that of the poorest half of humanity. Most disabled people belong to this poorest half. For the poorer half of humanity, communication tools remain basic. Most of the world's people - including most disabled people - have no access to computers, e-mail, or the Internet (a world-wide electronic information-sharing network). They still communicate with one another simply and directly, sharing information through spoken words, signs, pictures, gestures, and expressions. This book has been written for disabled people and those concerned for their well-being. Most such persons lack costly communications equipment. They learn primarily through spoken and printed language, pictures, and direct hands-on experience. One of my own biggest challenges as a health educator and disabled activist has been to demystify medical and technical knowledge and present it so that persons with little formal education can use it. The books that have grown out of this process include Where There Is No Doctor, Helping Health Workers Learn, and Disabled Village Children. In preparing these books, my co-workers and I have tried to follow a few basic guidelines for making them readable, interesting, and useful, including for those who do not have a lot of practice reading. These guidelines are on the following page. 1.Use lots of pictures. A picture is worth 1000 words. Simple line drawings are very useful for showing ways to do things. Try to make drawings of people realistic and attractive. Photographs add life. They help to make messages and alternatives more believable. To hold the attention of those who do not read much, try to use pictures on almost every page. Persons who are not used to using an index can flip through the pages, looking at the pictures to find the topic they want. 2.Keep language simple. Avoid specialized terms and big words. Say things in the day-to-day language of ordinary people. If you do use a less familiar term, explain it when you first use it. A list explaining difficult words may help. 3.Keep sentences and paragraphs short. Try to limit sentences to about 20 words. Look for ways to break longer sentences into shorter pieces. Also break up long paragraphs. 4.Add human interest. Use personal stories and real-life examples. In presenting information and innovative approaches, give examples of how persons have used and adapted them. Include enough details so the persons described seem human and interesting. 5.Present information simply, but not simplistically. People with little formal schooling are just as smart as anyone else. Often they have more skills for meeting basic needs (for example, producing food) than do scholars. Speak to them IN their terms and ON their terms, as equals. Do not talk down to them. They can understand complex ideas if you start with what they know, and build on that. 6.Develop and test the materials with a number of intended users. Be sure to include users or readers who have little formal education, or know least about the subject matter. Ask them if they understand it, enjoy it, and find the information or ideas important and useful. Ask what they like most, and what they like least about it, and if they have any suggestions for making it better. 7. Use bolding, BIG PRINT, italics, shading and boxes to emphasize important points. Also use "bullets" and arrows. This is a partial list of organizations and programs that help in developing assistive equipment at the community level. Included are programs that run training workshops or welcome apprentices who want to exchange ideas and explore "appropriate technologies." Some associations or parent organizations are listed that may be able to provide more local information and addresses in different countries. Those that contributed to the information in this book are marked with an asterisk (*). Action on Disability and Development (ADD), 23 Lower Keyford, Frome, Somerset BAI 1 4AP, UK. Tel: (44-1373) 473064. Contact: Michael Albu, ADD Mobility Service. Community rehabilitation programs in several countries. Help in starting workshops for wheelchairs, tricycles and other equipment; advice on designs, training, administration. African Medical and Research Foundation (AMREF), Wilson Airport, PO Box 30125, Nairobi, Kenya. Network of community health programs throughout Africa. * Appropriate Health Resources and Technologies Action Group (AHRTAG), Farringdon Point, 29-35 Farringdon Road, London EC1M 3JB, UK. Tel: (44-171) 2420606. Contact: Ann Robins, Disability and Rehabilitation Unit. Information and resources on primary health care and rehabilitation in the Third World. * Appropriate Mobility International, PO Box 3198, 2601 DD Delft, The Netherlands. Tel/Fax: (31-15) 2 12 22 70. Contact: Joep Verweij. Design and documentation of tricycles and other mobility aids. * Appropriate Technology International, 1331 H Street NW, Washington DC 20005, USA. Advice on setting up workshops and training for Whirlwind wheelchairs. Arigel's Haven Society, CPO Box 2840, Seoul, Korea. Contact: Roh Jae Dong. Walking and seating aids. * CBR Centre, PPRBM, JI Lu, Adisucipto Km7, Colomadu, Solo 57176, Indonesia * Centre for the Rehabilitation of the Paralyzed, PO CRP, Chapain, Savar, Dhaka, 1343 Bangladesh. Tel: (880-2) 06226 464/465; Fax: (880-2) 837969. Contact: Valerie Taylor. Training of orthopedic technicians and setting up small workshops. Many innovations in wheelchairs, trollies, and other aids. CEPRI (Center for the Promotion of Integrated Rehabilitation, Managua, Nicaragua), Apto 5765, Managua, Nicaragua. Tel: (505 2) 663608. A program of families of disabled people. Good self-help manuals in Spanish for and by disabled, especially spinal-cord injured, persons. * Christian Medical College, Rehabilitation Center, Vellore 632004, Tamilnadu, India. Contact: Dr. S. Bhattacharjee. Wide variety of innovative aids, wheelchairs, protective cushions for spinal-cord injured persons. Re-training in daily skills for rural life. Christoffel Blindenmission, Nibelungenstrasse 124, D-6140 Bensheim 4, Germany. Africa Regional Office-East, PO Box 58004, Nairobi, Kenya. Low-cost treatment of eye disease, spectacle-making, and optical equipment. * CISAS (Center for Health Information and Advisory Services) Apto. 3267, Managua, Nicaragua. Tel: (505-2) 661-662; Fax: (505-2) 224-098; e-mail: cisas@ibw.com.ni. Contacts: Maria Zuniga, Martín Reyes. Promotes community based health care and rehabilitation throughout Nicaragua. Also Child-to-Child involving disabled children in much of Latin America. * Colombo Friend-in-Need Society, 171 Sir James Peiris Mawatha, Colombo 2, Sri Lanka. Contact: Mrs. Swarna Ferdinand, Project Manager, Jaipur Foot Programme. Artificial limbs. The Disabled Living Centres Council, 380-384 Harrow Road, London W9 2HU. Contact: Tony Travis. Resource centre for information, and trials of equipment. * Disabled People International, 101-7 Evergreen Place, Winnipeg, Manitoba, R3L 2T3, Canada. International association of national organizations of disabled persons. Tel: (204) 287-8010. Many country programs are involved in community based rehabilitation and some in innovative technologies. * Economic and Social Commission for Asia and the Pacific (ESCAP), UN Building, Rajadaminern Ave. Bangkok 10200 Thailand. Tel: (662) 2881234; Fax: (662) 2881000. Contact: San Yuenwah. Workshops, documentation, and networking on assistive devices. Guyana Community Based Rehabilitation Programme, c/o European Commission, PO Box 10847, Georgetown, Guyana. Tel: (592 2) 42249. Fax: (592 2) 62615. Contact: Brian O'Toole. International training programs in CBR and child development. Good teaching materials. * Handicap International, Home office, 18 rue de Gerland, 69007 Lyon, France. Tel: (933 47) 861-1737. Contact: Jean-Baptiste Richardier. Orthopedic and rehabilitation equipment; designs, advice. * Handicap International - India, No.4 Ghandi Street, Colas Nagar, Pondicherry 605001, India. Contact: Xavier Mariadoss. Plastic-bucket braces. Handicap Internationai - Pakistan, Ahmadzai Colony, Sariab Road, Quetta, Pakistan. Contact: Pascal Simon. Limbs, wheelchairs, seating and walking aids. * HealthWrights, P.O. Box 1344, Palo Alto, CA 94302, USA; E-mail: healthrights@igc.apc.org. Web site: http://www.healthwrights.org. Contact: David Werner. Development and publication of educational and self-help materials for community based health care and rehabilitation. Works with PROJIMO (see below) on innovative assistive equipment. ILO, Center for International Cooperation and Appropriate Technology (CICAT/DUT). Stevinweg 1, PO Box 5048, 2600 GA Delft, Netherlands. Contact: Joep Verweij. Information on hand-power tricycles, worldwide. Detailed instructional materials with fine computer-drafted drawings. * Institute of Child Health, Department of Growth and Development, 30 Guilford Street, London WCIN 1EH. Tel: (44-71) 242-9789. 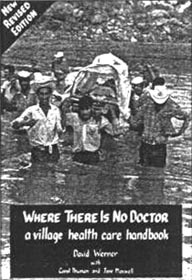 Information and research on planning health care. Course for trainers of Community Based Rehabilitation. Intermediate Technology Information Ring, Nudestraat 4, 6701 CE Wageningen, The Netherlands. Information on assistive devices and opthalmologic instruments. * Intermediate Technology Publications Ltd, 103-105 Southampton Row, London WC1 B 4HH, UK. Tel/Fax: (44-171) 436-2013. Publishing and supply of books on appropriate technology, tools, and workshop equipment. * International Commission on Technology and Accessibility (ICTA) Infomation Center, Box 510, S-162 15 Vallingby, Sweden. Tel: (46 8) 620-1700. Contact: Tomas Lagerwall. Documents appropriate assistive technologies. Conducts seminars and hands-on workshops in Africa and Asia. Useful publications on assistive devices. The Jairos Jiri Foundation, PO Box 1529, Bulawayo, Zimbabwe. Calipers, walking and sitting aids, wheelchairs, low-cost adaptations for children. * Liliane Stichting Fonds, P.O. Box 75, 5250 Vlijmen, Holland. Tel: (31) 7351-19029; Fax: (31) 7351-17354. Contact: Kees van der Broeck. Helps cover disability-related costs for individual children in poor countries. Also helps cover some costs of community programs for disabled children. * Mobility India, c/o The Association of the Physically Handicapped (APH), Hennur Road, St. Thomas Town, Lingarajapuram, Bangalore, 560084, Karnataka, India. Tel: (91-80) 5475165/or 5470390. Contact: Chapal Khasnabis (Mobility India), or N.S. Hema or D.M. Naidu (APH). Local production and training in high quality assistive and orthopedic aids. * Mukti, 93 Loyds Road, Madras-600 014 India. Tel: (91-44) 477498. Contact: Meena Dadha. Runs mobile limb-making clinics to villages. Make low-cost "Mukti limbs" out of plastic pipe, with Jaipur feet. Norwegian International Disability Alliance, P.O. Box 9218 Gronland, 0134 Oslo, Norway. Tel: 2217 4647; Fax: 2217 6177. email: srimapost@sbs.nida.msmail.telemax.no. Contact: Harald Lundqvist. Links with many disability groups and programs in Norway and beyond doing advocacy and innovative work. * People Potential, Plum Cottage, Hattingley Road, Medstead, Alton, Hampshire, GU34 5NQ, UK. Tel: or Fax: (01420) 563741. Contact: Ken Westmacott. Design of aids for disabled persons; training in low-cost production of wide range of rehabilitation aids, including appropriate paper-based technology (APT). * PROJIMO (Program of Rehabilitation Organized by Disabled Youth of Western Mexico). Apto. Postal 9, San Ignacio, Sinaloa, 82900, Mexico. Contact: Mari Picos and Conchita Lara. Community rehabilitation program. Disabled craftspersons design and make a wide range of assistive equipment. Peer counseling. Workshops and occasional short courses. Rehabilitation and Limb Centre, K.G. Medical College, Lucknow, India. Contact: Prof. M.K. Goel. Limbs, appliances, walking and seating aids. * Rehabilitation Centre, SMS Medical College, Jaipur 302004, Rajasthan, India. Jaipur Limb. Many other aids. Relevant Technology Workshops, PMB 2174, Jos, Plateau State, Nigeria. Wheelchairs, tricycles, hospital equipment. * RESCU, 21 Harare Street, PO Box 66044, Kopje, Harare, Zimbabwe. Contact: P. Gumete, Sheltered Workshop Manager. Wheelchair design, production and supply. * Sarvodaya Economic Enterprises Development Services, 41 Lumbiri Avenue, Ratmalana, Sri Lanka. Wheelchair production. Community based rehabilitation. * Spastics Society of Tamilnadu (SPASTN), Opposite TTTI, Taramani Road, Madras 600113, Tamilnadu, India. Tel & Fax: (91-44) 2350047. Contact: Aloka Guha. Wide variety of assistive aids and special seating. Karate for disabled children. * Stichting Demotech-Design for Self-Reliance, Postbus 303, 6950 AH Dieren, The Netherlands. Contact: Reinder van Tijen. Innovative designs for energy-saving, simple living. Gravity-lift elevator. Communication tools. * Tahanan Walang Hagdanang (House With No Stairs), 61 Banawe Street, Quezon City, Philippines. Tel (63 2) 695-2576. Wheelchairs built by wheelchair riders. * Teaching Aids at Low Cost (TALC), P.O. Box 49, St Albans, Herts ALI 4AX. Tel: (44 1727) 853-869; Fax: 846-852. Supplier of training materials; books on health care and disability, including those by David Werner. * Viklang Kendra Research Society, Rehabilitation Centre for the Handicapped 13, Lukerganj, Allahabad, 211001, India. Contact: Dr. Bhanerjee. Innovative appliances, limbs, and wheelchairs made from bamboo. * Volunteer Health Association of India (VHAI), Tong Swasthya Bhawan, 40 Institutional Area (Behind Qutab Hotel), New Delhi 110016, India. Tel: (91-11) 6518071-72; Fax: (91 11) 6953708. Contacts with many community rehabilitation programs throughout India. Many publications. Indian version of Disabled Village Children. * Wheeled Mobility Center, School of Engineering, San Francisco State University, 1600 Holloway Avenue, San Francisco, CA 94132, USA. Tel: (415) 338-2878. Contact: Ralf Hotchkiss or Peter Pfaelzer. World-wide network of wheelchair designers and builders. Hands~on courses in wheelchair building in many countries. * World Health Organization (WHO), 20 Avenue Appia CH-1211 Geneva, Switzerland. Contact: Dr. Enrico Pupulin, Chief Medical Officer, Rehabilitation. Tel: (41 22) 791 3656. Fax: (41 22) 791 4874. WHO has promoted Community Based Rehabilitation in many counties, and produced many valuable resource materials. * Worth Trust, 48 Thiruvalam Road, Katpadi 632007, Tamilnadu, India. Contact: Bos Cruz. Disabled workers produce a wide variety of assistive devices, from sophisticated to simple. Innovative research with carbon-fiber braces. This is a short list of writings and teaching materials about or relevant to innovative technologies for disabled persons. Many of these writings share the vision of self-determination and enablement that are encouraged in this book. 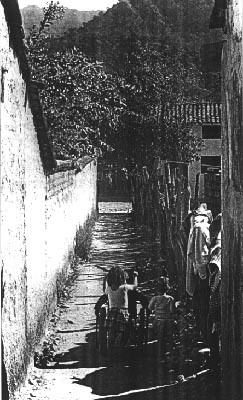 For a more complete list of early writings (before 1987) on ideas and aids for community based rehabilitation, see the Reference List in Disabled Village Children (see below). For more up-to-date lists, write to AHRTAG, TALC, Handicap International, or ICTA. Their addresses can be found below in the entries marked with an asterisk (*). The addresses are also in Resource List 1, pages 341-342. * Appropriate Paper-Based Technology. Slide show. Available from Teaching Aids at Low Cost (TALC), PO Box 49, St. Albans, Herts, AL1 5TX, UK. Price 4.50 pounds for self-mounted slides, 6.20 pounds for mounted slides. * Appropriate Technology - an essential part of a CBR programme, by Tomas Lagerwall. 1995. 21 pages, free. ICTA Information Center, Box 510, S-162 15, Vallingby, Sweden. Asia-Pacific Disability Aids and Appliances Handbook. 1982. 84 pages. ACROD, P.O. Box 60, Curtin, A.C.T., 2605, Australia. Behold Your Body: Anatomy and Physiology Anyone Can Enjoy, Volume One, by Charlene Penner. 1996. 400 pages. Rose Bud Publishing, 17126 Mt. Woodson Road, Ramona, CA 92065, USA. US$34.95. "Build Yourself" Plastic Wheelchair. Directions for assembly available from Spinal Research Unit, Royal North Shore Hospital of Sydney, St. Leonards, NSW 2065, Australia. 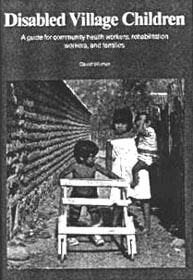 * Disabled Village Children: A guide for community health workers, rehabilitation workers and families, by David Werner. 1987. 664 pages. Available in English and Spanish through HealthWrights, P.O. Box 1344, Palo Alto, CA 94302, USA., or through TALC, PO Box 49, St. Albans, Herts, AL 5TX, UK. Also available - from other sources - in French, Portuguese, and other languages. Write HealthWrights for information. * Essential CBR Information Resources: an international listing of publications. 1996. 34 pages. AHRTAG (Appropriate Health Resources and Technologies Action Group), Farringdon Point, 29-35 Farringdon Road, London EC1M 3JB, UK. Guidlines for the Prevention of Deformities in Polio. World Health Organization, 1995. 1211 Geneva 27, Switzerland. Handling the Young Cerebral Palsied Child at Home, by Nancy Finnie. Dutton Sunrise, 2 Park Ave., New York, NY 10016, USA, 1975. 337 pages. Excellent, very complete information for home care, with many simple, practical aids and devices. 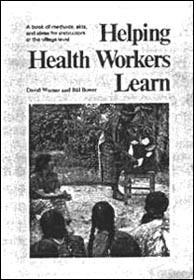 Helping Health Workers Learn, by David Werner. 1982. 632 pages. Available through HealthWrights, P.O. Box 1344, Palo Alto, CA 94302, USA. People-centered methodologies. Useful section on Child-to-Child. Independence through Mobility, A guide to the manufacture of the ATI-Hotchkiss Wheelchair, by Ralf Hotchkiss. 1985. 162 pages. Available through Wheeled Mobility Center, San Francisco State University, San Francisco CA 94132, USA. The Jaipur above-knee prosthetic systems: fabrication manual, by M.K. Mathur. 1989. 47 pages. SMS Medical Centre, Jaipur 302 004, India. The Lever-Powered Tricycle, Manufactured in Burkina Faso. 1995. 100 pages. Handicap International, ERAC, 14, Avenue Berthelot, 69361 Lyon, cedex 07, France. Price 55 FF. Handicap International (HI) also has many excellent booklets and videos on appropriate technologies for disabled persons, including artificial limbs, braces, wheelchairs, and crutches designs. Write HI for a list. A Manual: Appropriate Paper-Based Technology (APT), by Bevill Packer. Revised 1995. 120 pages. Intermediate Technology Publication , Ltd. 103-105 Southampton Row, London WC1B 4HH, UK. More With Less: Aids for Disabled People in Daily Life, by Gery van der Hulst and others. 1993. TOOL Publications, Sarphatistraat 650, 1018 AV Amsterdam, Netherlands. A Plastic Caliper for Children, by Handicap International staff at its Pondicherry, India branch. Available through Handicap International, or from ERAC, 14 avenue Berthelot, 69361 Lyon cedex 07, France. Positioning the Client with Central Nervous System Deficits: The wheelchair and other adopted equipment. Andrienne Falk Bergen and others. Second edition 1985. 237 pages. Valhalla Rehabilitation Publications, PO Box 195, Valhalla, NY 10595, USA. Promoting the Development of Young Children with Cerebral palsy: A Guide for Mid-Level Rehabilitation Worker, World Health Organization, 1993. 20 Avenue Appia, 1211 Geneva 27, Switzerland. Questioning the Solution: The Politics of primary Health Care and Child Survival, by David Werncr and David Sanders. 1997, 2oe pages, HealthWrights, P, O. Box 1344, Palo Alto, CA 943oa, USA. Rehabilitation technology in community-based rehabilitation: a compendium, by S. Olney, T. Packe and U. Wyss. Kingston, 1994. 212 pages. Available from School of Rehabilitation Therapy, Queens University, Ontario K7L 3N6, Canada. Special Seating, by Jean Anne Zollars. Second edition 1992. 92 pages. Otto Bock Orthopedic Industry, Inc., Rehab Publications, 3000 Xenium Lane, Minneapolis, MN 55441, USA. Teaching Yogasana to Mentally Retarded Persons, by Vijay Human Services. 1988. 120 pages. Krishnamacharya Yoga Maniram, 13 Fourth Cross Street, A.K. Nagar, Madras 600 028, India. Training in the Community for People with Disabilities, by Einer Helander et al. 1989. 582 pages. Available in English, French, Portuguese and Spanish. World Health Organization, 20 Avenue Appia, CH-1211 Geneva 27, Switzerland. Tricycle Production Manual, by Annemiek van Boeijen, Joep Verweij, et al. 1996. 110 pages. CICAT/DUT Stevinweg l, PO Box 5048, 2600 GA Delft, Netherlands. Joep Verweij and friends have also put together an excellent Inventory of Tricycle Models with examples and photos from around the world. For additional tricycle design resources, see page 202. UPKARAN: A manual of aids for the multiply handicapped. 106 pages. Spastics Society of India, Upper Colaba Road, Opposite Afghan Church, Colaba, Bombay, 400-005 India. We can play and move: a manual to help disabled children learn to move by playing with others, by Sophie Levitt. 1992. 56 pages. Available from TALC, PO Box 49, St. Albans, Herts, AL 5TX, UK. CARINA; CONCHITA LARA, EDGAR; MARI PICOS (first names first). blindness; speech problems, spinal-cord injury. "Handling the Cerebral Palsied Child at Home." India, land mines, women's rights. Nothing About Us Without Us is a book of true stories about people's creative search for solutions. It is an idea book, written for disabled persons and their relatives, friends, helpers, and anyone who favors A Society for All. The book differs from many appropriate technology manuals in that it puts emphasis not so much on the end-products - or things - as on the persons involved and the collective process of search and discovery. Nothing About Us has been written as companion to David Werner's earlier book, Disabled Village Children, now used in Community Based Rehabilitation programs worldwide. The book explores the development of innovative aids and equipment that can be made at low cost at home or in a small community workshop. Yet it also considers how to achieve fuller integration of disabled people into society: ways to help communities look at disabled persons' strengths, not their weaknesses. Examples of Child-to-Child activities show how disabled and non-disabled children can work, play and learn together, to enrich one another's lives. This is not a "cookbook" with precise instructions for making pre-designed devices. Rather it is about thinking through challenges and possibilities. Solutions tend to be best when the disabled person is a partner and equal in the problem-solving process. The goal of this book is to spark the reader's imagination: to stimulate a spirit of adventure! The book is based on years of collaborative work by David Werner and the disabled villagers who created and run PROJIMO, an innovative rehabilitation program in rural Mexico. However, it draws on experiences from many lands. Over 800 line drawings and 600 photos help make the information clear for those with little formal education. In the words of community rehabilitation pioneer, Mike Miles, "This is primarily a book about learning to think."